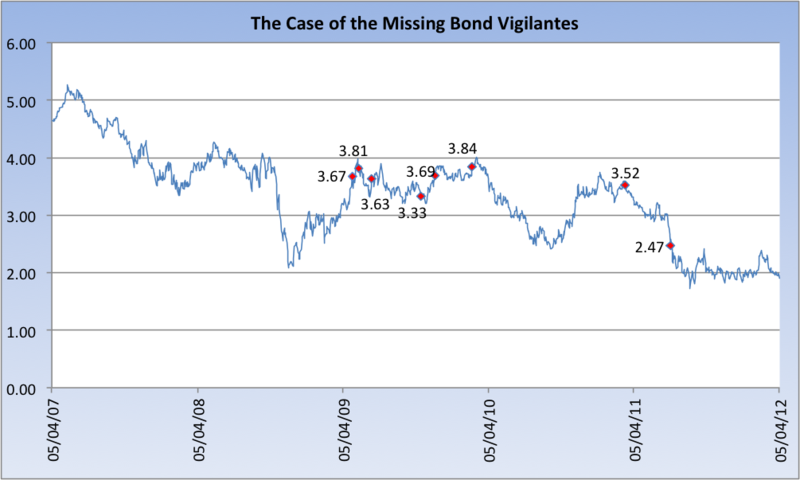 Bond Vigilantes: Where art thou?! - Miata Turbo Forum - Boost cars, acquire cats. Following up on a previous matter, Karl Denninger posted what is supposed to pass for a rebuttal to my recent post on government spending. To my eyes, as Jay Bookman so aptly put it, it looks like “the octopus trick, squirting black ink to cloud your retreat.” True enough. Anyway, done with that discussion. Paul Krugman presents a chart in his new book, End This Depression Now, that just screamed at me for replication and a bit of enhancement, so here it is. Professor Krugman wrote about the ongoing cries of the bond vigilantes, who have been warning for about three years running that we were on the cusp of runaway inflation and skyrocketing interest rates any day now. I have documented this a bit myself over the past three years (in response to Bowyer and Laffer here in July 2009, and again here last year), but Professor Krugman’s chart inspired me to revisit this topic. Below is a chart of the US 10-year Treasury, including clearly marked points in time at which we heard from various vigilantes (including, regrettably, President Obama). The 10-year yield at the time of the comment is indicated. Source: St. Louis Fed, Series DGS10. Markers placed on a best efforts basis. Reduced demand for money combined with rapid growth in money is a surefire recipe for inflation and higher interest rates. The higher interest rates themselves will also further reduce the demand for money, thereby exacerbating inflationary pressures. It’s a catch-22. It’s difficult to estimate the magnitude of the inflationary and interest-rate consequences of the Fed’s actions because, frankly, we haven’t ever seen anything like this in the U.S. The surge will push interest rates on 30-year fixed mortgages to 7.5 percent to 8 percent, almost the highest in a decade, Greenlaw said. And some argue that the bond market has been too confident about these longer-term rates remaining low, at a time when the economy is slowly improving and the government is running huge budget deficits. As the U.S. Treasury gets set to issue another $66 billion in notes and bonds this week, Pimco bond guru Bill Gross has a message for potential buyers: Stay away. August 2011, Standard & Poor’s downgrades the credit rating of the United States. ~2.50 10-year. Now, there’s getting it wrong because you modeled it wrong, and getting it wrong because you’re a political operative first and economist or market pundit second. Both are on display above. The political operatives, who to this day are still making noise about Weimar in the United States tomorrow, simply refuse to acknowledge the mechanics of a liquidity trap. I know Gross, to his great credit, has done some very public navel-gazing on this matter. Too bad the same can’t be said for the likes of Bowyer, Laffer, or the Journal. Last edited by Scrappy Jack; 05-11-2012 at 03:24 PM. I think the USD got a reprieve due to the Euro crisis. The above could support your hypothesis (assuming you are using "USD" as a weird short hand for "US Treasury yields"). It might also be interesting to add the dates of Federal Reserve non-standard open market operations to the timeline. The bond vigilantes are either biding their time or they are dogs on the Federal Reserve's leash. Quick Reply: Bond Vigilantes: Where art thou? !